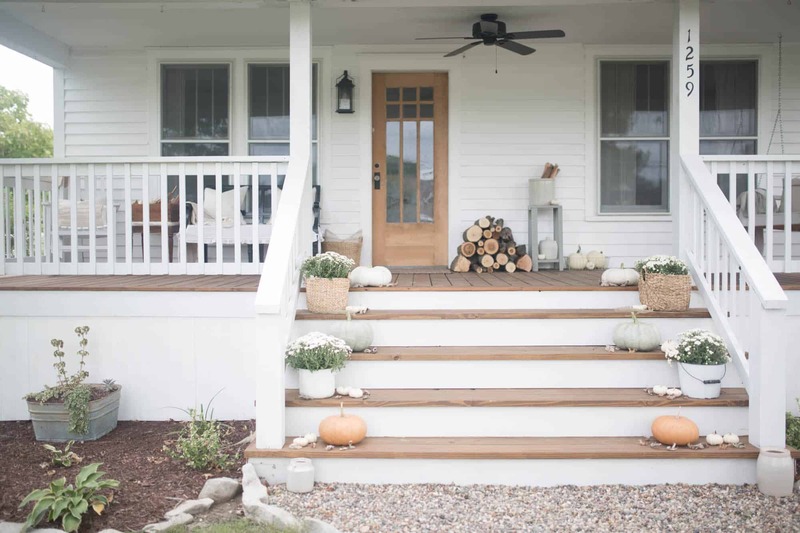 See our simple fall farmhouse front porch. I went with natural touches. 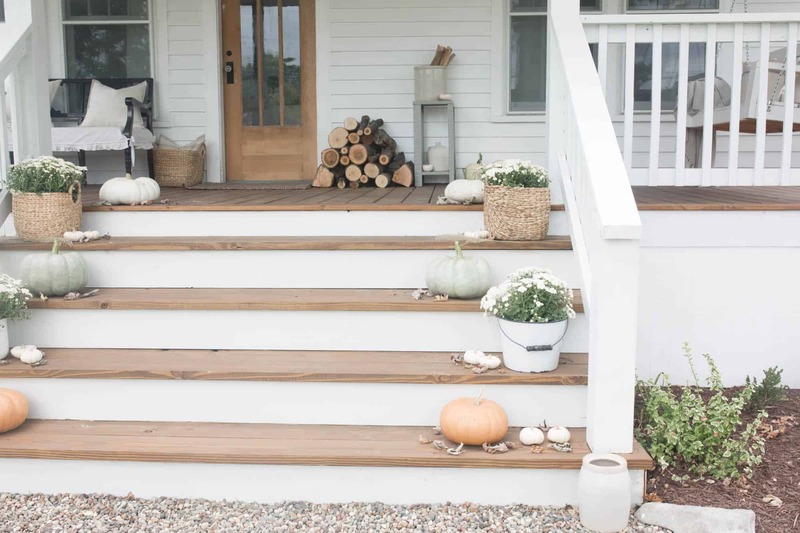 Pumpkins, mums and a small stack of firewood complete this look. 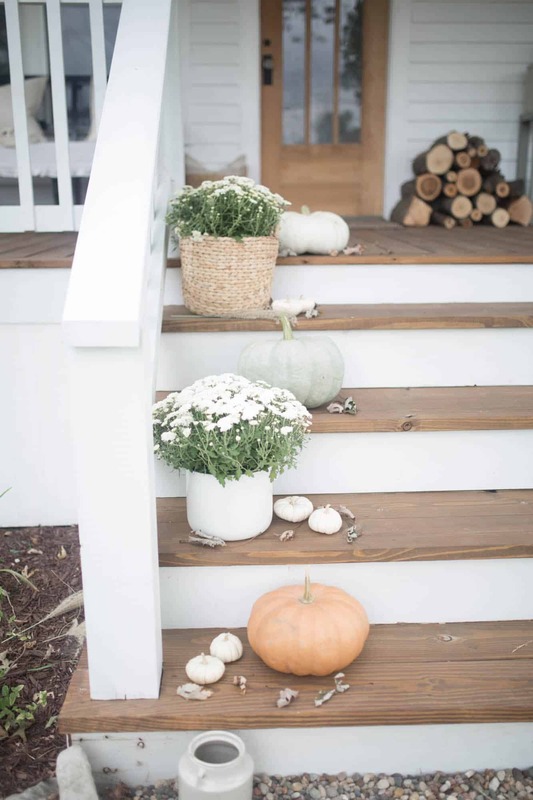 For our fall farmhouse front porch this year, I kept it simple. I don’t like to store a bunch of decor in the basement, so I always reach for natural things. Pumpkins, mums and firewood are my mainstays this year. I added in cozy fall textures, like wool, jute and wicker. Up until yesterday, it was slim pickins around here for pretty pastel pumpkins. All the stores only had the bright orange kind. Not that there is anything wrong with those. I have bought and cooked many. But, I wanted the heirloom varieties this year. Plus, I heard Alton Brown say, in an episode of “Good Eats” that jarrahdales are the tastiest breed of pumpkin on the market. I can’t wait to test that out! I added in a few white mums in enamel pitchers and wicker baskets. I struggled to pull out the prettiest pieces of wood from the wood pile. What says cozy like a stack of firewood? To bring in a little more natural texture, I brought out this jute and chenille rug from Finishing Touches Home. A crock full of kindling adds to the coziness of the firewood pile. We restored our front door to its original wood a few months ago. I think the color fits in perfectly with the simple fall decor. 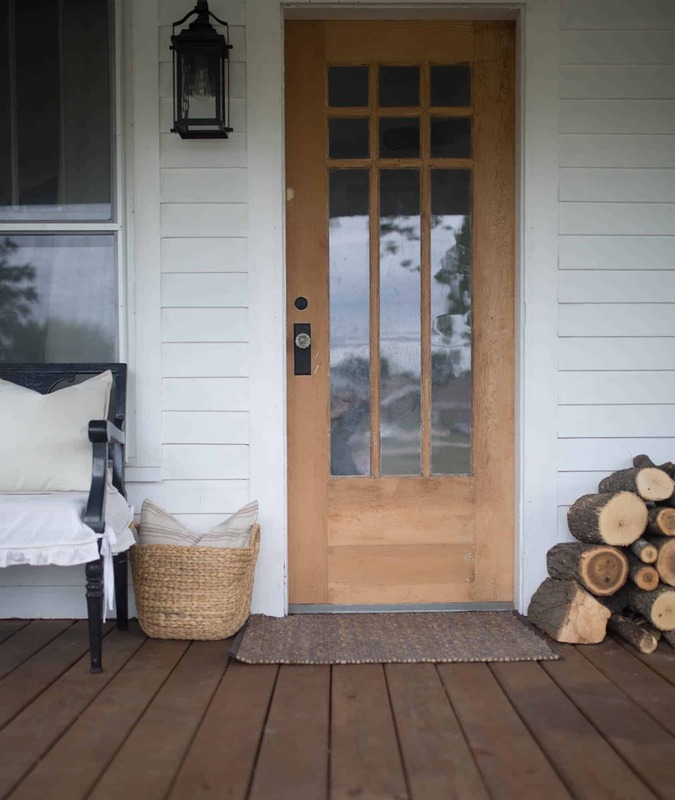 A ticking stripe pillow, and a wicker basket, soften this front door area up a bit. I left the handmade white ruffle slipcover on the bench. A few neutral pillows, and a cozy blanket, bring in warm textures. 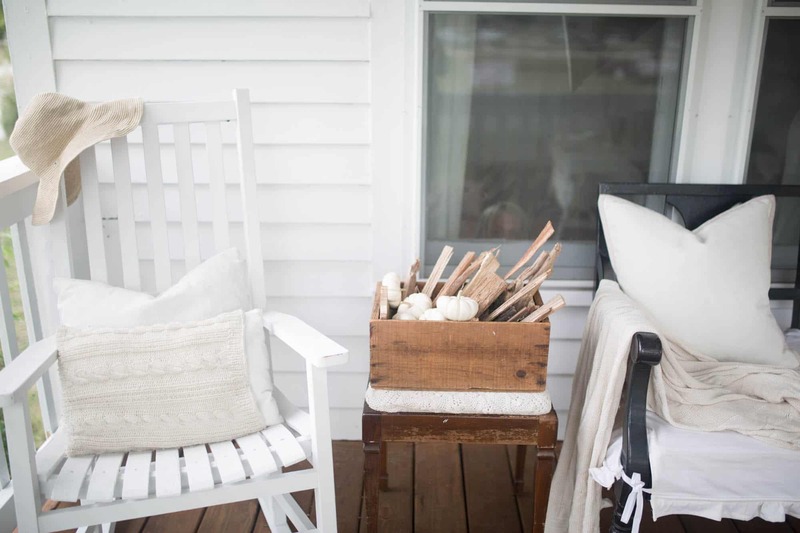 An antique box full of kindling adds a little warmth to this side of the porch. Cable knit pillows and throw blankets are my favorite way to add coziness in the cooler months. 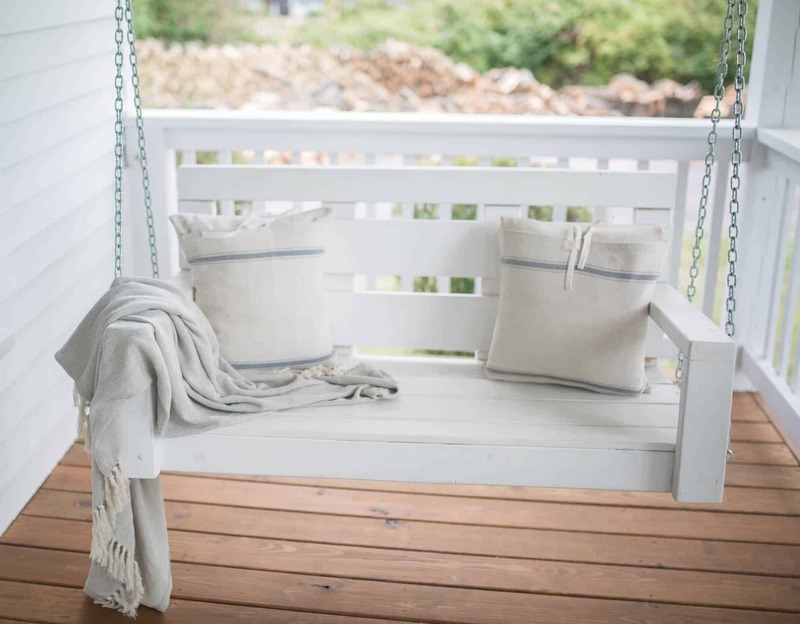 I put grain sack pillows on the porch swing. This cotton blanket with tassels has the perfect soft shade of gray. Our whole front porch is newly renovated. You can read all about the transformation HERE. 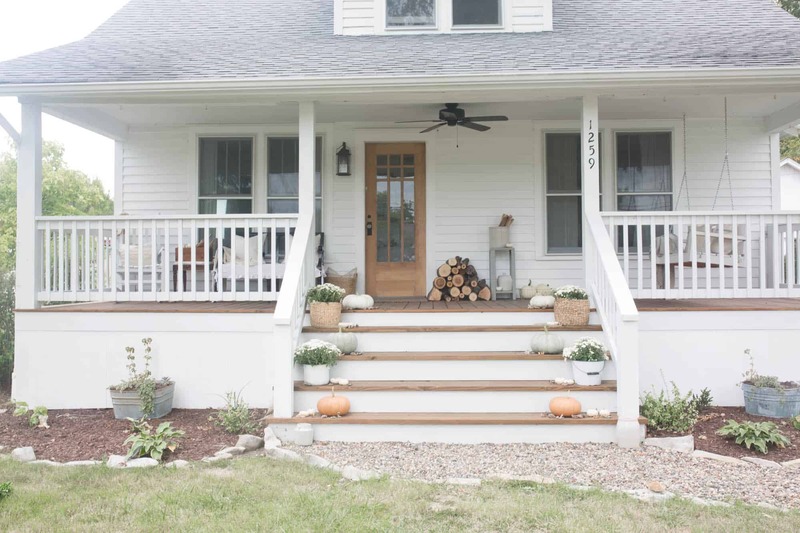 I hope you enjoyed this little tour of our farmhouse front porch in the fall. 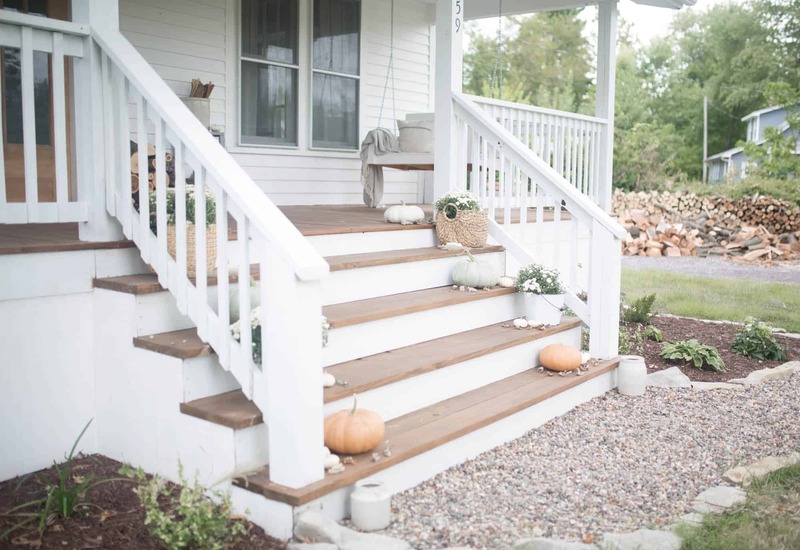 Be sure to check out the lovely homes below to see their porches all spruced up for autumn! 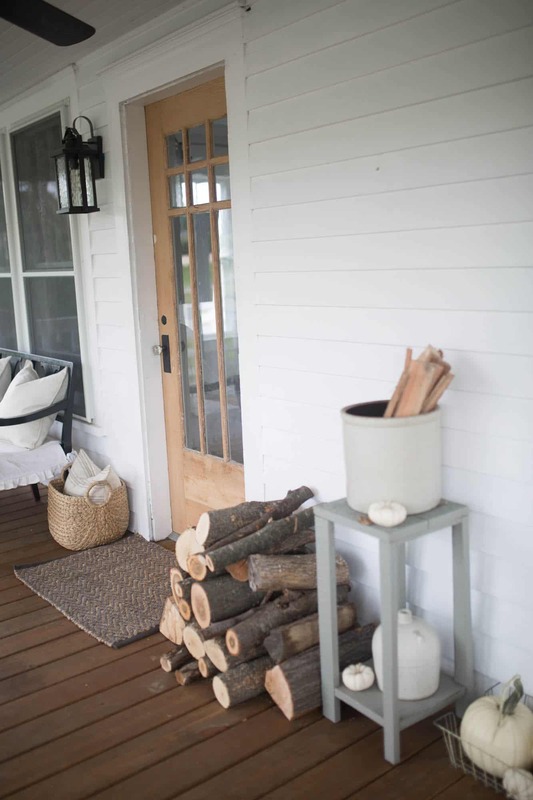 Lisa, your porch has me swooning…I love all the white and neutrals – and your front door is gorgeous. 😀 What a perfect place to cozy up with a hot cuppa. <3 Have a great day! 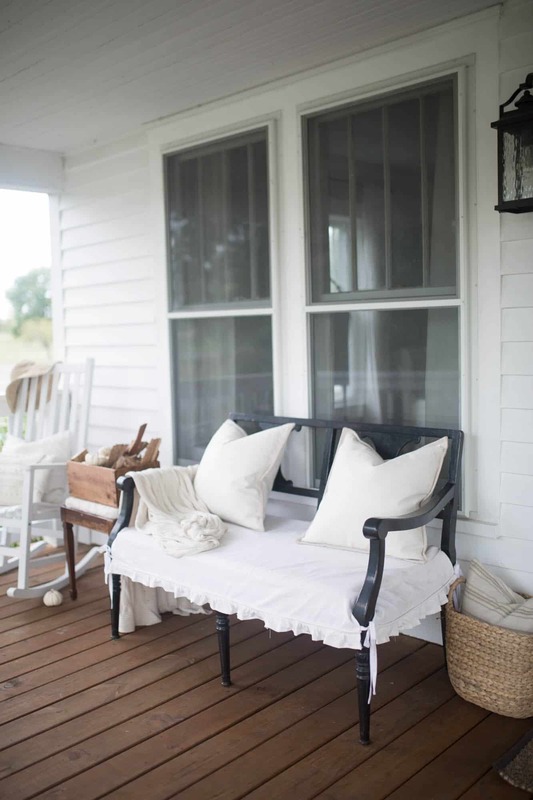 I definitely have porch envy, it’s so beautiful! I can imagine you will enjoy countless hours there this fall! Thank you so much, Julie! 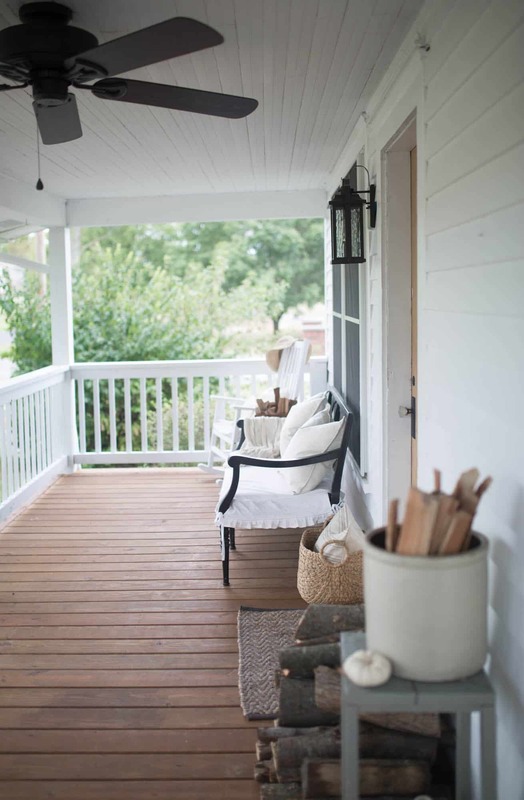 We definitely will now that the weather is more suited for front porch sitting! Aww thanks so much Leigh! It was fun doing this blog hop together! 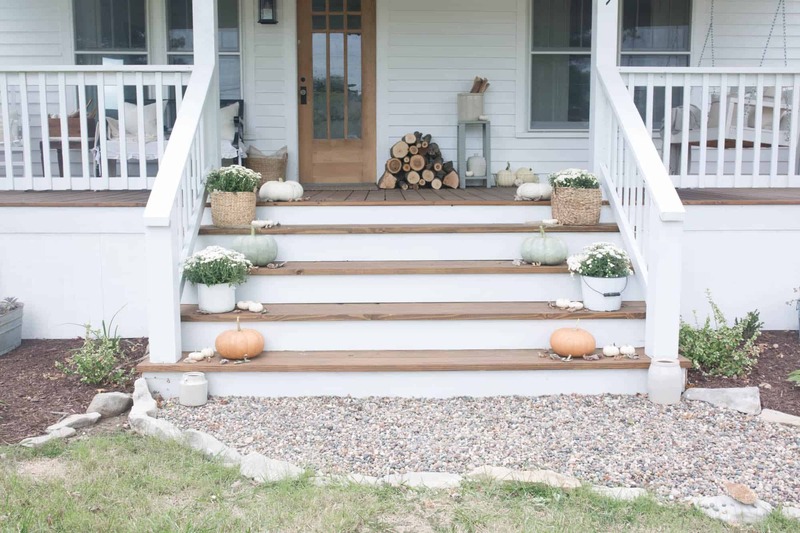 Remove the pumpkins and mums, and it is a beautiful, everyday porch. Very clean and simple and emotionally relaxing. 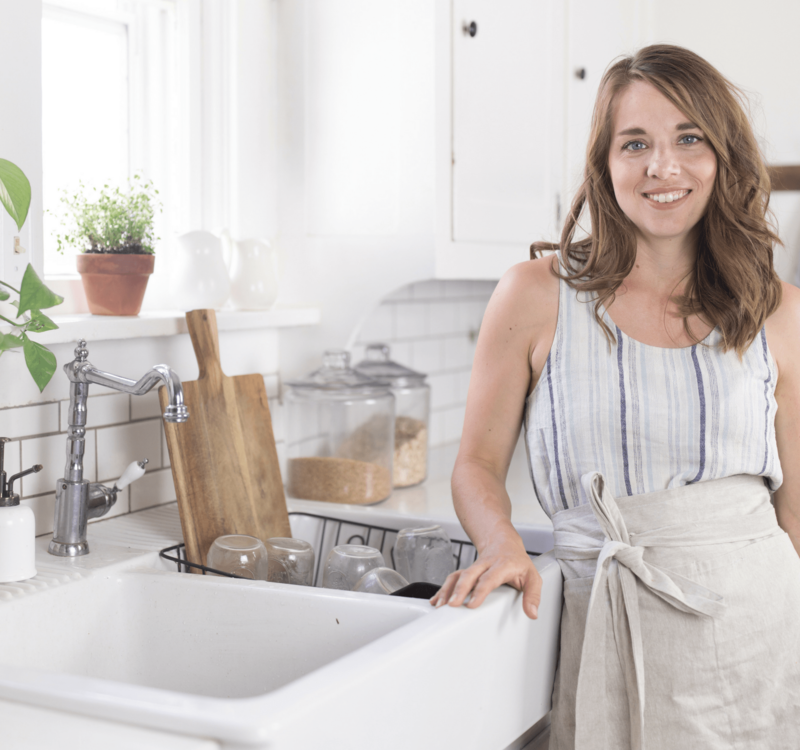 I love pulling everyday items from different spaces in my house to use in different settings; neutral blankets and pillows, crocks, woven baskets. These are basic elements brought to life with a few living seasonal purchases. Thanks for sharing your beautiful simple ideas with us. p.s. I would love to see a video “walkabout” through your home. And let me say, I cracked up (in a good way) when I saw that you used wood from the wood pile to decorate your front porch. 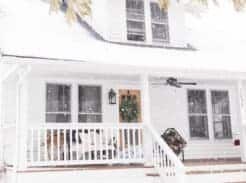 I tell people they could put me in a cabin in the mountains, with no access to buy seasonal decorations, and my cabin would be totally decked out for each holiday: berries, branches, nuts, vines for wreaths, foliage, moss, abandoned nests with hatched eggs. You name it, I can use it. Now, I can add the wood pile to my repertoire. It looks great! I love seeing all your transformations! Lisa, your porch is so gorgeous! I am really loving the enamel buckets on the porch steps with the mums in there. They’re so cute! I haul out some firewood too for one of our flower buckets, after the flowers have died, I think it adds so much texture and natural beauty to the porch. So beautiful! 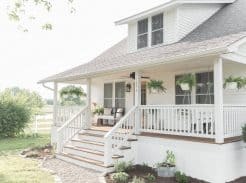 Such a wonderful and welcoming porch. 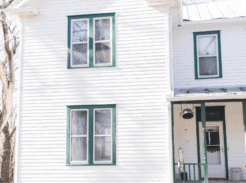 I also love farmhouses and purchased a little 570′ farmhouse in the Appalachian mountains a few years ago. I love your home and all the beautiful decor you use. You did an amazing job! ? I love the width of your stairs. Do you know about how wide they are? Thank you so much Leann! I don’t know exactly. I would go out and measure them, but we sold our house.